Source: Reformatted article from Brick and Clay Record 38:9 (1911-05-01), page 451. The Plant of the Mound City Roofing Tile Co. Note the Tile Roof on the Office Building. Located at 3301-9 Morgan Ford Road, St. Louis, is the modern up-to-date plant of the Mound City Roofing Tile Co. The office building, the machinery building and the two-story building near, are built of hollow vitrified tile, furnished by the Vigo Clay Co., of Terre Haute, Ind. As will be seen in the illustration, the roofs are covered with tile, which are simply laid on the roof without fastening, the weight of each tile holding the others down, as they are of the interlocking type, made by the Mound City Roofing Tile Co. 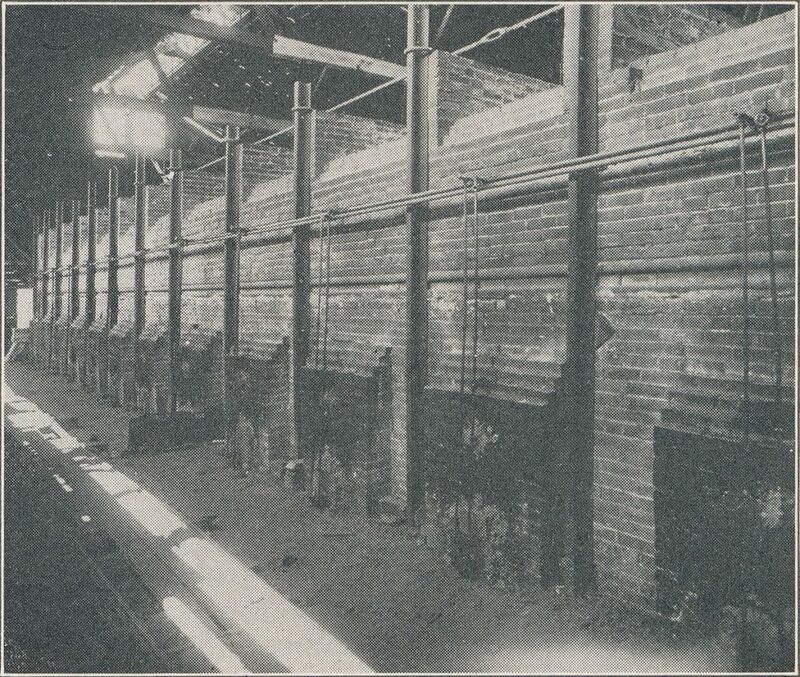 The shale which is used in the manufacture of the tile is brought from Malcolm Station, thirteen miles from the plant. It is stored in the clay shed, which adjoins the two-story building shown, where it is allowed to go through the sweating process, at least two weeks, before it is ground up in the seven-foot dry pan. After grinding, it is elevated and screened through a piano wire screen, after which it is run into an eight-foot pug mill, where it is thoroughly pugged, sufficient water being added to form a stiff mud. It is then deposited in clay bins, of which there are four, each bin having a capacity for one day’s run, so that the pugged shale is always four days old before it is used. Each revolving roofing tile press has a capacity of 5,000 interlocking tile per day; the trimming press turns out from 400 to 500 crestings per day and from 700 to 900 hip rolls per day; the auger machine will turn out 12,000 shingle tile or from 6,000 to 8,000 imperial Spanish tile per day. In addition to the above the company is well equipped for making terra cotta fittings, such as terminals, special starters, special crestings, and large size finals. The dies used for making the tile are cast iron forms filled with plaster dies. The capacity of the plant is 10,000 interlocking tile per day, or 12,000 shingle tile and 5,000 interlocking tile per day, or 5,000 interlocking tile and 6,000 Spanish tile per day. From the press room the tile and trimmings are shoved into tunnel dryers, of which there are ten, and after drying 30 hours, are taken out at the other end of the dryer and run directly into the kiln where they are set for burning. As will be noticed, the kilns are long, each kiln having twelve furnaces on each side. The burning is done entirely with fuel oil and is accomplished in from 36 to 40 hours from start to finish, cone 05 being used on top and cones 06 and 07 at the bottom of the kiln. The oil burning system used is the Schurs. The oil is drained into a large underground steel tank from which it is forced to the oil burners by pump pressure, 40 lb. pump pressure being used. The atomizing is done with 80 lb. of steam pressure, the Schurs burners being used throughout. By using oil, all flashed ware is avoided and the tile are all of a beautiful red color throughout also all colors of glazed tile are produced with practically no loss in burning. One of the Large Kilns in Which Brick Are Burned with Fuel Oil. The Mound City Roofing Tile Co. is shipping their tile from Maine to California and from Minnesota to Texas, and have had a fine run of business for the past three years.